The Dragon Boat Festival is one of the most spectacular traditions of ancient China. It is an exciting period for rowing competitions marked by the eating of rice dumpling. In some Chinese-speaking societies, the day is also known as the “Poets’ Day”. 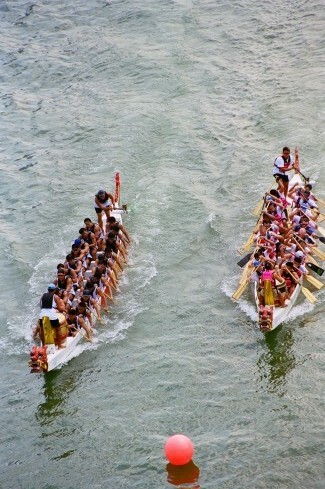 The first Dragon Boat Races were recorded in the Tsin period. It became popular in the Tang Dynasty ( 618-907 A.D.) spreading throughout the Yangtze River Valley and to most of South China. One paddler traditionally stands in the boat searching for Qu Yuan’s body while a drummer on board and the ferocious-looking dragon designs were added to frighten away evil water spirits. This is because Chinese people traditionally regarded the dragons as presiding over the water and having dominion over rainfall. It is also the supreme symbol of power and benevolence in the Far East. In the present day, the Dragon Boat Festical is held annually in different nations world wide. In China alone, 20 million people are active in this sport which is organised in the various cities and provinces. The ritual aspect of dragon boat racing has a deep cultural heritage and springs from religious beliefs. The colourful and traditional rites are preformed on the dragon boats before and after the races. They reflect deep reverence for the vessels despite certain degrees of variation in the procedures followed by the believers. There are basically two important ceremonies which have to be performed for dragon boats. They have to be blessed and “awakened” before the races and then properly induced to “repose” afterwards. Four days before the festival, the dragon boats are taken out of their storage yard and their dragon heads and dragon tails are attached to them. 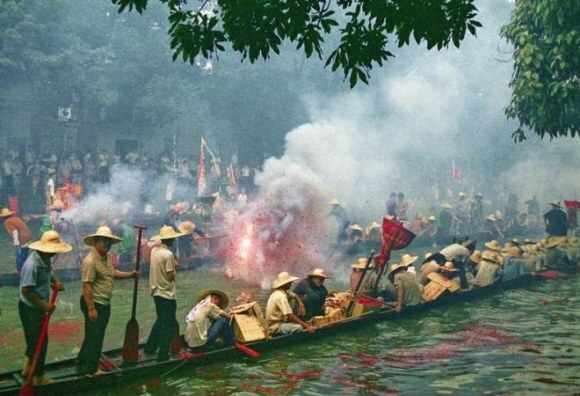 A benediction ritual done with great pomp and ceremony follows this and involves the burning of paper bills in front of the dragon boats, the making of offerings and chanting of prayers to heavenly gods. This ritual serves to ward off evil and to sanctify and bless the dragon boats. In addition, this action is supposed to make the dragon boats strong and fierce and therefore fit to compete in the exciting races. When this has been done, each dragon boat is rowed out to sea, on a course perpendicular to the nearby temple and then back to the temple with the drummer beating the drum. This procedure is repeated three times. The performance of these rituals and the staging of dragon boats races show a community’s dedication to its gods. In return, the members of the community will be protected from unfriendly spirits of the sea and blessed with happiness and prosperity. “Life” is given to a newly-built dragon boat at a ceremony performed by a Taoist priest a few days before the actual festival. Holding a bell and a sword into the “Fu Zhou” (a paper bill with “magic” words) while chanting some “magic” words, he then touches the dragon head, tail and drum with the sword, following which paper money is burnt and “magic” sand is sprinkled on the dragon head. A community leader is invited to dot the eye of the dragon head and, afterwards, the dragon’s eyes will be drawn in red with a brush. When the races are over, the dragon head, tail and drum are removed from each dragon boat and stored either in the temple or in another place agreed upon by the community. Incense is burnt to thank the heavenly gods. Meanwhile, the body of a dragon boat itself is usually covered with sand along the shore near a temple or put on appropriate racks and covered with roof-shape tin foil covers. By performing these basic procedures, the dragon boats are considered to be properly induced to “repose” until the next Dragon Boat Festival when the whole cycle of ceremonial rites will be repeated.